What did the In-Store Lit Group think of Elizabeth J. Church's "The Atomic Weight of Love"? I was saying to Jane that when I do book club talks, so many folks ask for historical novels. I've done my best to get a few more on my radar, and this month's In-Store Lit Group selection kept that in mind. Elizabeth J. Church's novel focuses on Meridian Wallace, a young woman from Greensberg, Pennsylvania*, whose mother, widowed young, works hard scrubbing toilets, so that Meri can attend the University of Chicago. She starts dating Jerry Bloom, a fellow student, and also turns the head of Alden Whetstone, a professor. Both are likely to present problems to Meri's education - Jerry will probably be called to the front (it is World War II, after all), while Alden has his secret project in New Mexico. I'm not giving much away by revealing Meri's decision; most of the story does take place in New Mexico. It's a place where the husbands work and the wives, many of whom are stifled academics like Meri, garden and decorate and volunteer and attend book club. And most of all, they raise children. But Meri doesn't have children. And Alden becomes more absorbed in his work and less interested in Meri, except when it comes to serving his needs. Meri, however, finds an outlet in observing crows, returning to her interest in ornithology. And there she finds a fellow observer, a younger academic who is something a free spirit. OK, I'll say it because it is the 1960s; he's a hippie. The Atomic Weight of Love reminds me of a bit of the feminist self-actualization novels of the 1970s from Marilyn French and Marge Piercy, of women finding themselves after being stifled by the lack of choices. Like these classic novels, there's an awakening of consciousness as the years go by. But Meri has a little more trouble making a definitive choice than some previous heroines, which led to some heated discussion. The novel's chapters are framed by bird observations, with "a parliament of owls" followed by a brief description. And birds play an important part in the book, so it is not surprising that the book was recommended to me by my friend Nancy at the Schlitz Audubon Nature Center. If you like birds, this book will have extra resonance for you. Church is said to have been inspired by her own family for the story. Her father was a research chemist in Los Alamos. And she wondered what options there could have been for the women who settled in town with their husbands. Reading and discussing Elizabeth Church's novel led to several surprises. Reaction to the story was varied, but it was harder to predict than I expected who would take to the book. Several of the male attendees were big fans, which I did not expect from a novel where the villain (if you think there is one) was Alden. But it's possible that I read the story with certain expectations - a number of the readers had more sympathy for Alden than I expected. Being that we had several women in the group who had made similar decisions as Meri (as well as one nuclear chemist), the conversation turned out to be quite lively. Oh, the parenting issue alone! It just goes to show that some of the best conversations arise when there's a difference of opinion about a book. Church has moved from Algonquin to Random House for her next book, All the Beautiful Girls, which releases March 6, 2018. It's about a woman who also transforms her identity, but instead of going from academic to housewife, she becomes a Las Vegas dancer. And now for a few answers to questions that historical fiction fans are sure to ask. Did Church do research for this book? Yes. Is Meridian based on a specific person? Not to my knowledge. Here are our next three In-Store Lit Group discussions. On Monday, December 4, 7 pm, we're reading Zadie Smith's Swing Time, which was a finalist for the National Book Critics Circle Award and was longlisted for the Man Booker Prize. On Tuesday, January 2, 7 pm (Boswell closes at 5 pm on New Year's Day), we're reading newly minted Nobel Laureate Kazuo Ishiguro's Never Let Me Go. On Monday, February 5, 7 pm, we're reading Chloe Benjamin's The Anatomy of Dreams, a novel with speculative thriller elements about lucid dreaming, which won the Edna Ferber Fiction Book Award from the Council for Wisconsin Writers. We're so excited about Benjamin's second novel, The Immortalists, which publishes January 9, 2018 and Benjamin visits Boswell on January 18, 7 pm. That's a lot of dates, so pay attention. *Digression alert: years ago I read a nonfiction book partly set in Greensberg, Pennsylvania called The Malling of America. It's out of print but I found the Kirkus Review. I am fascinated that the author reissued it 17 years after its original publication through Xlibris. Peter Edelman, author of Not a Crime to Be Poor: The Criminalization of Poverty in America, cosponsored by Community Advocates Public Policy Institute. Peter Edelman is the Carmack Waterhouse Professor of Law and Public Policy and the faculty director of the Center on Poverty and Inequality at Georgetown University Law Center. Edelman was a top advisor to Senator Robert F. Kennedy and served in President Bill Clinton's administration. In his new book, the author of So Rich So Poor shows how not having money has been criminalized and shines a light on lawyers, activists, and policy makers working for a more humane approach . Karen Dolan spoke to Peter Edleman in The Huffington Post. On being asked about extreme poverty, he notes: "Extreme poverty means having an income of less than half the poverty line. That’s less than $9,000 a year for a family of three. The stunning fact is that in 2010, there were 20.5 million people who had incomes that low. And perhaps even more disturbing — six million people have no income other than food stamps (SNAP). That means an income at one-third of the poverty line or less than $6,000 a year for a family of three. You can’t live on that. So, these are people who are really in extreme trouble." Read more about the event in the Shepherd Express Book Preview column. Registration is not required, but if you are coming, it would help us get a handle on how many folks are attending. Thursday, November 30, 7 pm, at Harry and Rose Samson Family Jewish Community Center, 6255 N Santa Monica Blvd: Francine Klagsbrun, author of Lioness: Golda Meir and the Nation of Israel, presented by Tapestry: Art and Ideas. Francine Klagsbrun, a regular columnist for The Jewish Week and a contributing editor to Lilith, now offers a major new biography of a world figure with Milwaukee roots. Lioness has been called the definitive biography of Golda Meir: the iron-willed leader, chain-smoking political operative, and tea-and-cake-serving grandmother who became the fourth prime minister of Israel and one of the most notable women of our time. From Stewart Kampel in Hadassah magazine: "Almost 40 years after her death, Golda, as she was universally known, stands as one of the most important Jewish women of the 20th century. Russian born, American educated and a fierce Zionist since her teenage years, she immigrated to Palestine in 1921. As a young woman, she worked on a kibbutz and later navigated the shoals of Israeli politics for 50 years, sometimes nobly and sometimes with rock-solid stubbornness. She was autocratic and contradictory, tough and practical, intelligent and gifted. She put the destiny of the Jewish people above all else, sometimes wittily, sometimes pugnaciously and sometimes, she acknowledged, at a terrible price." Here's more about her life in Milwaukee from Jim Higgins, who wrote about the book for the Journal Sentinel: "Golda attended North Division High School, but fled to Denver for refuge with her older sister after a conflict with her mother, who wanted Golda to go to secretarial school and to marry a much older man in the neighborhood. At her father's urging, she later returned to Milwaukee and graduated from North Division. In October 1916, she started college at Wisconsin State Normal School, a predecessor of the University of Wisconsin-Milwaukee, with a future as a teacher in mind. (UWM later named its library in her honor.) "
Ethan Bronner also reviewed Lioness in The New York Times Book Review, and calls the book "a thorough and absorbing examination of the woman and her role in Zionism and Israel." Klagsbrun has written more than a dozen books. her writing has also appeared in The New York Times, Newsweek, and Ms. Magazine. The JCC is located just northeast of Bayshore Town Center. Admission is free to this event. Here's what is selling at Boswell. I'm guessing the impact of the year-end best-of lists is already having an impact on sales. The Washington Post announced their top ten and that might have had an impact on our sales of Andrew Sean Greer's Less. We also noticed an increase in sales for two other titles, Saints for All Occasions and The Power. Greer's novel was published under the Lee Boudreaux imprint, but the editor of this eponymous imprint has since moved over to Doubleday. Remaining books from the imprint will be published by Little, Brown, per Publishers Marketplace. It's our best week of sales to date for Matthew Walker's Why We Sleep: Unlocking the Power of Sleep and Dreams. The author, a professor of neuroscience and psychology at UC Berkeley, has written a book that has won praise from Daniel Gilbert, who called this "a canny pleasure that will have you turning pages well past your bedtime." Here's Mark O'Connell's review in The Guardian. Cold Clay is the second mystery from Juneau Black, the team of current and former Boswellians Sharon K. Nagel and Jocelyn Koehler. This time ace reporter (and fox) Vera Vixen investigates a new discovery, bones found in a nearby orchard. Could they be the remains of Julia Elkin, the restless wife (and moose) of Joe, the proprietor of Joe's Mug? We had a number of readers of the first book come in when they learned the second was available. Sales for paperback fiction tend to go down a bit in the fourth quarter, partly because shoppers trade up to hardcovers for gifts, and partly because the release schedule dries up this time of year, with paperback releases being put off till January. Our bestseller numbers in this category are kind of blah, but it's nice to see all the talking up we've done of Pachinko really paying off. We've had several customers say it was the best book they've read this year. Because we like the hardcover edition too, we're discounting it 20% off through Christmas. You can reserve it on our website and pay in the store at the discounted price. No registration required. This year's crop of Olive Editions, including Roxane Gay's Bad Feminist, the hip looking, limited edition, rack size repackagings of Harper titles, looks like it's skewing towards college campuses, based on my guess of what classes are reading. I assume that is based on what has worked best in previous rollouts. The other selections in the class of 2017 are Gilbert King's Devil in the Grove, Zora Neale Hurston's Dust Tracks on the Road, Barathunde Thurston's How to Be Black, Edward P. Jones's The Known World, Louise Erdrich's The Round House, and Linda Hirshman's Victory: The Triumphant Gay Revolution, and Dolen Perkins-Valdez's Wench. I read both the Jones and Erdrich novels and recommend both. Not one but two books from the Frances Lincoln imprint hit the top ten this week. One if the latest press-to-play book from Jessica Courtney-Tickle. This one features The Nutcracker. The other is Katherina Manolessou's Look for Ladybug in Plant City. Daisy the bunny and Basil the lizard solve a series of mysteries in this new book that like Pierre the Maze Detective, sort of take on the mantle of Where's Waldo books with additional puzzles (or in the case of Pierre, mazes). Here's the Kirkus review. Over at the Journal Sentinel, Jim Higgins collects books for holiday gift giving. Here's the list of adult titles, and a separate one for kids. I'm hoping to have a display up this week. We're doing another poster auction this weekend, from today (Small Business Saturday) through Tuesday (which is Giving Tuesday). Publishers periodically provide us with these blow-up book jackets and advertisements to promote new releases and upcoming events, and though we use many of them to decorate Boswell, we just can't showcase them all. We get numerous requests from customers about their availability so in September, we decided to raise money for a charity to benefit Hurricane Harvey rebuilding by auctioning them off. It was successful enough that we're doing it again, this time raising money for Unidos, the fund from the Hispanic Federation offering help to victims of Hurricane Maria in Puerto Rico. Here's how it works. If you decide you're interested in a poster, we'll place a bid for you for whatever amount you want. There's no minimum. After Tuesday, the high bidder will be contacted. You'll have up to a week to pick up the poster. After that, we'll contact the second highest bidder. Because you're making a purchase from us, there is tax on your purchase so factor that into the equation. And then we'll donate the entire amount (except for the tax, which we give to the government) to Unidos. No mailouts, alas. And of course, you can always donate directly without buying a poster. Here's a link to Unidos Disaster Relief and Recovery Program to Support Puerto Rico. Thanksgiving means a lot of things to people, but to me, it's about friends and family, which is why I'm talking about "Cold Clay" and "The Story of Arthur Truluv." I haven't done a Thanksgiving post in a number of years, and what's more, I haven't done a non-Sunday or Monday post in a couple of weeks. But the nice thing about Thanksgiving for me is it's a chance to slow down for a moment and wait, mostly because our house is too messy to host relatives. I swept a few rooms this morning and to me, that's a victory. As I wait for us to leave to visit family in Illinois, I've finally had time to read for a bit. I just finished reading our bookseller Sharon's second mystery, written under the pen name Juneau Black along with former bookseller Jocelyn. Cold Clay returns to the village of Shady Hollow, where Vera Vixen, ace reporter (and fox), finds herself in the midst of another case when the bones of a missing resident turn up in a nearby orchard. Could it be that Julia Elkin (a moose), the wife of beloved coffee house proprietor Joe of Joe's Mug, never made it out of town when she left a decade ago? And will Vera ever get to work on the story, what with her boss D.W. (a skunk) pressuring her to focus her attentions on the new etiquette school in town, run by Octavia Grey (a very elegant mink)? Bookseller Lenore (a raven) helps out a bit as does police officer Orville (a bear), though that second relationship is more like half flirtation, half competition to solve the case. Second time is just as charming for this cozy series with a anthropomorphic twist and a good dose of humor. When Octavia asks if Vera is interested in dance class, I'm guessing you already know the only dance that our ace reporter claims proficiency in. The Shady Hollow folk often find that friends can fill in well when family leaves you wanting. And that's one of the themes that runs through Elizabeth Berg's latest novel, The Story of Arthur Truluv. That's not really Arthur's last name - it's just the nickname that teenage Maddy gives him when they start meeting in the cemetery. Arthur is there for his daily visits to his recently deceased wife Nola. Maddy's struggling with her own loss, of her mom, and well, but she's also come to the cemetery to escape bullying in class. And her dad, well, he just doesn't understand (with thanks to DJ Jazzy Jeff and the Fresh Prince for explaining this to me in detail some years ago). And she's got a thing for Anderson, an older guy who's been courting her. Arthur is often pestered by his next door neighbor Lucille, who is a bit intrusive, but that annoying habit is offset by her delicious baking. And of course maybe she just needs company too. And then she finds love, in an old high school sweetheart who comes back into her life. But things happen. And of course, Arthur, Maddy, and Lucille are meant to be together. They are hardly perfect people (well, Arthur comes close) but they are good and kind people and they need each other. This story is one of those books I like about readymade family, but it's also about real family too. The lessons of The Story of Arthur Truluv are more subtle than so many novels being touted this year. I'm so grateful for so many of these wonderful books, being lauded at prize time and sure to be in best-of-the-year roundups. But there's room in the world for this kind of book too, which with very few changes in details (mostly about the food), could be about characters of any numbers of races and ethnicities. Love and family are universal! I haven't read enough of Elizabeth Berg's canon to know where this fits, but even before I read it, I thought that this might be her Ove (as in A Man Called Ove) book and having read it, I think that was fair. It's not French and there's less philosophy and design theory, but I was also reminded a bit of The Elegance of the Hedgehog. And there's no bookstore, but I was reminded of any number of beloved bookstore novels as well. If someone asks me for another book like The Storied Life of A.J. Fikry and they want to move past the obvious (How to Find Love in a Bookstore, which, needless to say, I still have to read), Arthur's a good candidate. We all know that there are only so many plots and if you ask me the "do the best we can and make the best of the time we have" might just be my favorite. After a few very successful ticketed events with Ms. Berg (at the Friends of the Milwaukee Public Library Literary Lunch and the Lynden Sculpture Garden Women's Speaker series), we're going with a free event this time, the closest we are coming to a holiday party. When I discussed the idea of having some refreshments, I turned immediately to my friends at Beans and Barley. I've been anxiously awaiting the arrival of the holiday cookies, and if you've ever had them, I'm sure you've been anxiously awaiting them as well. We decided to pair up with Beans, who is cosponsoring this event, and we'll have an assortment of their cookies (and wanna bet you'll go back and buy another box or tray for your holiday party), as well as our very favorite dessert, the poppyseed cake, which comes in loaf or layer, but we serve as mini cupcakes. Honestly, I'm a chocolate person in general, but this cake it's killer butter cream frosting is out of this world. We serve it at our first fall sales rep presentation (sorry, that one's closed to the public) and I start getting inquiries from booksellers as soon as the date is announced: "Are we getting the poppyseed* cake?" and if I know what's good for me, we are. I know you are probably thinking of the Thanksgiving feast you are about to eat, or just ate, or perhaps ate weeks ago. But also think about Friday, December 8, when we'll be hosting Elizabeth Berg at Boswell (the refreshments come from Beans but the event is at the bookstore) at 7 pm for The Story of Arthur Truluv. Yes, I'm trying to up the incentive with the treats, but I know that in the end, a wonderful evening with Berg is the main event; cookies and cake are, as we well know, the dessert. *I fretted over whether poppyseed is one or two words. 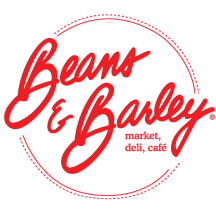 In the end, I bowed to the Beans and Barley catering menu. I'd hold onto this menu, because they do a fabulous job. And yes, Boswell is closed today but we're back to regular hours tomorrow. We'd extend them, but they already seem pretty long to me. **After you read The Story of Arthur Truluv, your mouth will be watering. So it's no surprise that one of Berg's picks is a cookbook called Beat This, from Ann Hodgman. Lucille would approve. Steven Wallace, author of Obroni and the Chocolate Factory: An Unlikely Story of Globalization and Ghana's First Gourmet Chocolate Bar, in conversation with Jody Hirsh, Judaic Education Director of the Harry and Rose Samson Family Jewish Community Center, as part of the Tapestry arts series. From WUWM's Lake Effect: "Just over a quarter-century ago, Milwaukee native Steve Wallace started Omanhene Cocoa Bean Company. It is not one of the huge players on the scene, nor is it a small boutique that makes truffles. Its greater significance is that it makes chocolate bars in the African nation of Ghana, where the cocoa beans are grown. "The 26-year journey has not always been easy or straightforward, and in fact started with a journey Wallace took to Ghana as a high school exchange student. He chronicles that and the path that led to the creation of his chocolate company in a memoir, called Obroni and the Chocolate Factory: An Unlikely Story of Globalization and Ghana's First Gourmet Chocolate Bar." Listen to the whole interview here. About the Author: Native Wisconsinite Steven Wallace is the founder and CEO of the Omanhene Cocoa Bean Company, the first company to sustain exports of premium chocolate manufactured entirely in Africa, and credited with producing the world's first single-origin chocolate bar in 1994. And yes, we're now selling Omanhene chocolate bars at Boswell. Here's what's been selling at Boswell this past week. 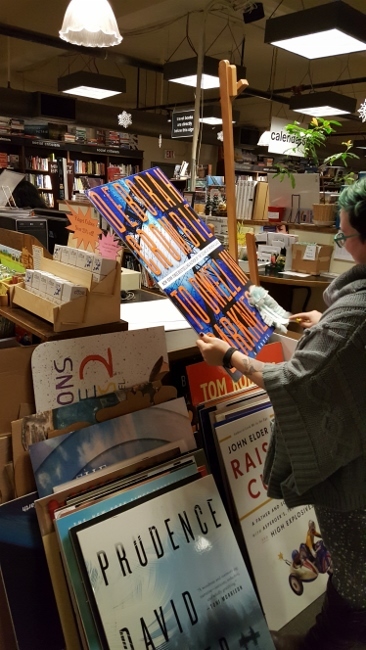 Louise Erdrich's Future Home of the Living God would definitely be on our "what to read after Handmaid's Tale" if we had one, but we don't have one yet, and this time of year, it's hard to find a free display table. In January? That's another story. The book seems to be the top-reviewed book of the week and compared to her last two novels, the opinions are more polarized. Here's a profile from Bethanne Patrick in Los Angeles Times. Erin Vanderhoof called it "smart and thrilling" in Vanity Fair. But Ron Charles has issues in The Washington Post. It appears that Obama: An Intimate Portrait had a huge start, based on my observation that there are no copies at either wholesaler and something like 35,000 copies on order. It's the kind of book, due to the $50 price point, that builds over the holiday season. The book is topping bestseller lists and Souza is speaking to capacity crowds. Why? The New York Times ponders: "Here are a few hunches: With Mr. Obama giving few public statements since leaving office, Mr. Souza’s words and images will have to work as a conduit for now. Since posting a photo from a military helicopter as Mr. Obama left the White House on Inauguration Day - 'We used to live there,' Mr. Souza heard the departing president remark on that ride to no one in particular - Mr. Souza has been constructing a virtual timeline that juxtaposes events of Mr. Obama’s presidency with Mr. Trump’s, one that has so far been defined by defying norms, bucking expectations and attempts to reverse the legacy of his predecessor." We were a little unprepared but not completely surprised that Min Jin Lee's Pachinko was rushed out in paperback on November 14. That old problem--do you rush out a paperback when an award is about to be announced, or do you wait to pull the trigger after the win or loss. My guess is that if Pachinko had been the favorite, Grand Central would have reprinted hardcovers and perhaps moved the paperback date out. But a finalist slot, even without a win, is enough extra publicity to take advantage of the book's momentum, which one doesn't always have ninth months after pub date. She talked to Jonathan Soble in The New York Times: "Ms. Lee spent nearly two decades conceiving, writing and rewriting Pachinko. The seed was planted in 1989, when, as a student at Yale, she attended a talk by a Protestant missionary who had spent time among the zainichi. Until then, she said, she had never heard of this branch of the Korean diaspora. Growing up in the United States, she was used to Koreans being viewed as hardworking and upwardly mobile, a model American minority. But many zainichi, she was surprised to discover, languished at the bottom rungs of Japan’s socioeconomic ladder." I am so glad to be living through the slime renaissance. The gooey and often green substance rose to prominence on Nickelodeon in the 1980s, but nowadays, you can't go into a office supply store without seeing a display for make your own slime. I think that the Crazy Aaron putty craze is also part of this. And that's why it's not surprising that our notes for Prim Pattanaporn (@sparklygoo) and Alena Woods's The Zen of Slime says to make sure the book is display next to our thinking putty. And yes, it turns out that the slime crazy is being driven by social media. Here's Charlotte Lieberman in Marie Claire on the craze: "The trend is almost post-modern in its apparent pointlessness. I never would have guessed that I'd someday live in a world where it was normal to spend hours watching other people squish an inorganic substance (and I say this as a Millennial who grew up playing with Nickelodeon's Gak) but then again, what is normal anymore? Given that most of our lives are mediated by a screen—and that that screen spends a lot of time lately delivering nerve-frying, anxiety-inducing news—it makes sense that we would be drawn to the hyper-tactile, harmless, primordial nature of hands kneading goo. I'm not a movie scheduler, but I'm sort of surprised that there are two major movies based on book properties, one called Wonder and one called Wonderstruck. The marketing push for Wonder was this week, which was helped by good reviews (and a very enthusiastic readership base that has been anticipating this film with Julia Roberts, Owen Wilson, and Jacob Tremblay). Wow, listen to this from Glenn Kenny in The New York Times: "Directed by Stephen Chbosky, who wrote the screenplay with Steve Conrad and Jack Thorne, the movie has a cast that’s wonderful from top to bottom. As Auggie’s parents, Ms. Roberts and Mr. Wilson are doing things we love to see those actors doing. (Ms. Roberts lets loose with her trademark ebullient laugh at least once, and Mr. Wilson explains life’s issues to Auggie in a droll drawl.) All the young people in the ensemble, anchored by Mr. Tremblay’s Auggie, are perfect. Wonder is that rare thing, a family picture that moves and amuses while never overtly pandering." Over at the Journal Sentinel, Jim Higgins reviews Basketball (and Other Things), by Shea Serrano, illustrated by Arturo Torres. He enjoys this "entertaining" book. Here's one of his observations: "The questions Serrano asks and answers (and that Arturo Torres illustrates in engaging graphic-novel style) include many barstool argument starters...as well as some nerdily conceptual ones." Michael Perry, author of Montaigne in Barn Boots: An Amateur Ambles Through Philosophy. The beloved memoirist and bestselling author of Population: 485 reflects on the lessons he's learned from his unlikely alter ego, French Renaissance philosopher Michel de Montaigne. Written in a spirit of exploration rather than declaration, Montaigne in Barn Boots is a down-to-earth (how do you pronounce that last name?) look into the ideas of a philosopher "ensconced in a castle tower overlooking his vineyard," channeled by a Midwestern American writing "in a room above the garage overlooking a disused pig pen." Perry champions academics and aesthetics in a book that ultimately emerges as a sincere, unflinching look at the vital need to be a better person and citizen. Jim Higgins, of the Journal Sentinel wrote of Perry, "Of the recent books extolling and commending French essayist Michel de Montaigne, Michael Perry's new one might be the Montaignest. Like Montaigne - the 16th-century writer and philosopher generally considered the Babe Ruth of personal essayists - Perry knows both the acute agony of passing a kidney stone and the chronic anxiety of living in a time of conflict. And if you're willing to stretch a definition, both might be considered gentlemen farmers (though Montaigne never had to sing for his supper on public radio)." Full article here. Wisconsin native Michael Perry is a humorist, radio host, songwriter, and the bestselling author of several nonfiction books, including Visiting Tom and Coop, as well as a novel, The Jesus Cow. This event if free but will be very popular. Come early for a good seat! Boswell and the Friends of the Milwaukee Public Library announce a very special event with Alexander McCall Smith, author of The No. 1 Ladies’ Detective Agency and other titles featuring Precious Ramotswe, the Isabel Dalhousie novels, 44 Scotland Street, and many other beloved titles. It's your last chance to see Alexander McCall Smith before we sell out. This is his first visit to Milwaukee since 2004! Tickets are $29, including admission to the event, all taxes and fees, and a copy of The House of Unexpected Sisters. $5 from each ticket to this event will be donated back to the Milwaukee Public Library Foundation. This event is the launch of the Friends of the Milwaukee Public Library Fill the Shelves program. Fill the Shelves is a wonderful way to donate a book into library circulation, complete with a bookplate indicating you as the donor. Purchase one of the selected titles at Boswell, featured from November 16 through the end of 2017, and we’ll handle the details. You’ll even get a donation acknowledgement from the Friends. Kirkus Reviews describes Smith's new book as "A deceptively slow opening movement ushers in one of the most complicated dockets ever for the No. 1 Ladies’ Detective Agency." Read the full review here. Bronzeville at Night:1949 is a debut poetry collection by Vida Cross referencing her ancestry as a third generation Chicagoan and Bronzeville resident, as well as the artwork of Archibald J. Motley Jr., and the poetic research of Langston Hughes. Ian Bodkin raves “Cross pulls from Archibald Motley Jr.’s brushstrokes to conjure a music that plays behind the commotion of the street.” Visit here for more information. Vida Cross was born and raised in Chicago, Illinois. From 2009 to 2013, Cross was a Cave Canem Fellow. Her work has appeared in The Literary Review, The Reverie Journal, and The Journal of Film and Video. Vida splits her time between Chicago, Illinois and Milwaukee, Wisconsin. She teaches English Literature at Milwaukee Area Technical College. Here's what's selling at Boswell. Isabel Allende's In the Midst of Winter is her 19th novel. I'm going to use the Kirkus Reviews description: "Thrown together by a Brooklyn blizzard, two NYU professors and a Guatemalan nanny find themselves with a body to dispose of." The reviewer is a fan, though it didn't get the coveted Kirkus star. Anita Felicelli really liked the contemporary love story (the courtship of the two professors) but felt that the immigration backstory was a bit Manichean (I have no idea what that means), compared to say, John Ridley's American Crime on television. But I would say that most Allende writers would prefer it in the style that Allende wrote it. Does that make sense to you? A lot of this week's programming happened offstage, so to speak. In addition to our event with podcaster Mike Duncan, we sold books at several theater, school, and luncheon events, and Amie and I did a talk at the Wisconsin Woman's Club. One of the books that popped was one of Jane's holiday picks, What She Ate: Six Remarkable Women and the Food that Told Their Stories, by Laura Shapiro. Megan Volpert wrote in Pop Matters: "These women are all more or less famous, all more or less influential in their professional spheres. Yet their food stories are common, are all too familiar in their resonance as modern feminist conundrums. Shapiro portrays each of her six subjects with warmth and as fully rounded characters. They win some and lose some, they resist or persist when they are able. The universal necessity of food ensures that it is a powerful tool, and Shapiro’s approach to gendering it is enlightening without being too insistent about what works or what doesn’t." Selling books at the Ozaukee Family Services luncheon convinced me to read Saints for All Occasions, which is now on my staff rec shelf. Sullivan's presentation. Ron Charles in The Washington Post called Saints "a quiet masterpiece": "In a simple style that never commits a flutter of extravagance, Sullivan draws us into the lives of the Raffertys and, in the rare miracle of fiction, makes us care about them as if they were our own family." Notice we had very strong backlist sales - The Engagements turned out to be the top seller after Sullivan mentioned that Reese Witherspoon bought the film rights. Her are a few of Witherspoon's other properties, as noted in Glamour. And here's Ron Charles's review of The Engagements. For the second week in a row, the paperback edition of Thomas L. Friedman's Thank You for Being Late: An Optimist's Guide to Thriving in the Age of Accelerations sits in our top ten, and appears to be even more timely. The publisher's description: " His thesis: to understand the twenty-first century, you need to understand that the planet's three largest forces--Moore's law (technology), the Market (globalization), and Mother Nature (climate change and biodiversity loss)--are accelerating all at once." Some reviews complained the book was too long and seemed to be an indictment more of Friedman than his work. Gillian Tett in Financial Times was more positive, but worried it might be a bit difficult to get Friedman's Minnesota Nice philosophy to go global. From this week's school visits were from Sean Connolly, whose new book is The Book of Massively Epic Engineering Disasters. From Stacia Barton on Salt Lake City's Good4Utah: "Arranged chronologically from ancient times to the 21st century, the book takes readers on an illustrated tour through the physics and technology of crumbling buildings, sinking ships, wobbly bridges, mud-stuck tanks, and much more. Covering a wide range of snafus, mishaps, and outright disasters throughout history, some infamous, like the Titanic sinking and Chilean miners getting trapped underground, and others lesser known, like the Fidenae Stadium collapse in ancient Rome, these hands-on experiments put readers' newfound knowledge into action." You can watch Connolly here. Over at the Journal Sentinel, Mike Fischer reviews Future Home of the Living God, the new novel from Louise Erdrich. He writes: "In the future chronicled by Cedar Hawk Songmaker, a pregnant Native American writing a journal that her unborn child may never read, evolution has reversed course. Infants are losing the power of speech. Plants and animals increasingly resemble long-extinct fossils. Weird birds take flight, alongside dragonflies with three-foot wingspans and softball-sized eyes. 'Our bodies have always remembered who we were,' muses Cedar. 'And now they have decided to return. We’re climbing back down the swimming-pool ladder into the primordial soup.'" Fischer is mixed on the new book. Also reviewed (well, profiled) is Vacationland: True Stories from Painful Beaches, by John Hodgman. The review from Carolyn Kellogg originally appeared in the Los Angeles Times. She likes it! The Milwaukee Turners and Boswell Books are pleased to cosponsor the 2017 Frank P. Zeidler Memorial Lecture featuring Pulitzer Prize Winner Dr. Heather Thompson. Blood in the Water: The Attica Prison Uprising and its Legacy has been awarded both the 2017 Pulitzer Prize in history as well as the 2017 Bancroft Prize for history for its focus on the 1971 Attica Prison uprising. From Mark Oppenheimer in The New York Times: "There’s nothing partisan or argumentative about Blood in the Water. The power of this superb work of history comes from its methodical mastery of interviews, transcripts, police reports and other documents, covering 35 years, many released only reluctantly by government agencies, and many of those “rendered nearly unreadable from all of the redactions,” Ms. Thompson writes. She has pieced together the whole, gripping story, from the conditions that gave rise to the rebellion, which cost the lives of 43 men, to the decades of government obstructionism that prevented the full story from being told." Heather Ann Thompson is an award-winning historian at the University of Michigan. She is also the author of Whose Detroit? :Politics, Labor, and Race in a Modern American City and the editor of Speaking Out: Activism and Protest in the 1960s and 1970s. She served on a National Academy of Sciences blue-ribbon panel that studied the causes and consequences of mass incarceration in the United States and has given congressional staff briefings on the subject. Celebrate Veterans Week with The Wisconsin Veterans Chamber of Commerce and Dryhootch, who present David Chrisinger, author of See Me for Who I Am: Student Veterans' Stories of War and Coming Home. See Me for Who I Am aims to undermine current cultural stereotypes of veterans. It brings together twenty young student veterans working to bridge the media-created gap that divides them from the American people they have fought to protect. With thoughtfulness, humor, and honesty, they relive and relate their worst memories, illustrate shared experiences, explain to us the fulfillment of combat, and show us what going to war really entails. For veterans, these voices will ring familiar. For civilians, the stories open a view into a world few ever see and, in the process, affirm our common humanity. David Chrisinger is an Associate Lecturer at UW-Stevens Point, where he teaches a veteran reintegration course, Back from the Front. He also assists college administrations and corporate employers to create and sustain more productive relationships with veterans. He is the founder and managing editor of Stronger at the Broken Places, a website dedicated not only to raising awareness of the struggles and triumphs of American veterans throughout history, but to helping today's generation of student veterans tell their stories of war and coming home. Mike Duncan will be joining us at Boswell to discuss his new book about the fall of the Roman Republic. This free event is sure to be popular. Doors close if we reach capacity. Get here early! Mike Duncan is one of the foremost history podcasters in the world. His award-winning series The History of Rome chronologically narrated the entire history of the Roman Empire over 189 weekly episodes. Duncan has continued this success with his ongoing series Revolutions, which so far has explored the English, American, French, and Haitian Revolutions. From Kirkus Reviews: "Award-winning history podcaster Duncan offers a lively, extremely well-informed chronicle of nearly seven decades of Roman political and social life, less well-known than the age of Caesar, Cleopatra, and Marc Antony that followed." Read the whole review here. First up is our gothic. Wendy Webb’s first novel, The Tale of Halcyon Crane, received the 2011 Minnesota Book Award for genre fiction. Her second and third novels, The Fate of Mercy Alban and The Vanishing, established her as a leading suspense novelist, who reviewers are calling the Queen of the Northern Gothic. When Eleanor Harper becomes the director of a renowned artists' retreat, she knows nothing of Cliffside Manor's dark past as a tuberculosis sanatorium, a 'waiting room for death.' After years of covering murder and violence as a crime reporter, Eleanor hopes that being around artists and writers in this new job will be a peaceful retreat for her as much as for them. But from her first fog-filled moments on the manor's grounds, Eleanor is seized by a sense of impending doom and realizes there's more to the institution than its reputation of being a haven for creativity. And now our gumshoe. Gone to Dust is a sinister tale of a brutal crime and the ultimate cover-up. How do you solve a murder with no useable evidence? Private detective Nils Shapiro is focused on forgetting his ex-wife and keeping warm during another Minneapolis winter when a former colleague, neighboring Edina Police Detective Anders Ellegaard, calls with the impossible. A woman’s body has been found, brutally murdered and covered in bags of vacuum bag dust to destroy all evidence. When Shapiro digs into the dead woman’s history, it not only leads to further mystery but also to the potential killer. From Jim Higgins's profile of Perry in the Journal Sentinel: "'I'm really in over my head with this,' but that's part of the fun, Perry said of his literary stroll with Montaigne. 'There are people who've built entire careers parsing just a paragraph of his. But on the other hand, I think that's part of Montaigne's charm, you have a right to sit in your deer stand and read him and go, Oh, well, here's what he made me think.'" Read the whole article here. And finally, don't forget about our event with Alexander McCall Smith on November 16. Tickets are $29. We're almost sold out, so don't wait for the last minute. Buy here. We're also selling books as the designated bookseller for Matt Bellassai's event on Wednesday, November 8 at Turner Hall Ballroom. Tickets are still available. Get them here. And we're also the designated bookseller for the Hillary Rodham Clinton What Happened? tour. This one's almost sold out. Purchase here. Note that the basic ticket to this event does not include the book.